Employee engagement is gaining a vast and critical importance in today's highly competitive and dynamic business environment. An engaged workforce is a vital asset for the organization that contributes their efforts for the benefit of the organization. The chapter identifies the differences in engagement level of employees with respect to job and organizational characteristics (gender, age, tenure, and position) of employees in selected telecom companies in India. This co-relational study undertakes internet-based survey questionnaire based on Utrecht Work Engagement Scale (UWES-9). Hypotheses have been tested through ANOVA, post hoc analysis, and correlational analysis procedures to estimate the relationships among variables. The results of the study found significant differences in the work engagement level of employees with respect to age, years of work experience, and employee position except gender. The strategies to drive employee engagement in the organization are also proposed. In today’s highly competitive global business arena, every organization aspires to have a pool of engaged employees. Employee engagement has been related to building a firm’s competitive advantage. Employee engagement, in fact, can make or break the business bottom line (Lockwood, 2006). Engaging employees especially by giving them participation, freedom, and trust is the most comprehensive support anticipated by employees. What employees expect and what organization delivers is a complex and crucial problem to be addressed by identifying such gap. Engaged employees are physically, cognitively, and emotionally attached to their organization and highly involved in their job with a great enthusiasm and performance. They tend for going an extra mile beyond the employment contractual agreement. Businesses are resisting for increasing their performance, market share, competitive advantage and sustainability of business in a cut-throat competition moment, and managers have been struggling with numerous challenges of turnover, low productivity, conflicts, and low motivation of their employees. 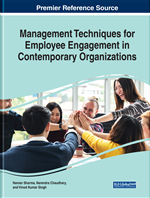 Now, in order to succeed and put their company ahead of competitors the need for highly engaged employees becomes key determinant for the employers. Organizations are emphasizing upon the significance of employee engagement while taking into consideration all the positive outcomes that engaged employees could bring to the workplace viz; higher productivity, lower absenteeism and turnover, customer satisfaction, innovation and much more. Hence, organizations attempt to hire, maintain and retain those employees who are high on their energy, drive to contribute, dedication, commitment and engagement levels. Employee engagement has a direct impact on the employee’s association and productivity and further on the performance of the entire organization. A fully engaged workforce is more efficient, delivers higher levels of customer satisfaction, attains higher productivity levels, and ensures lower turnover rates, which all translated into improved overall performance (Buhler, 2006). Discretionary Effort: It is the intensity of peoples’ voluntary effort that they are providing to the task and activity, but above and beyond the minimum requirements. Elbow Room: It is a degree of freedom of employees within the organization to do whatever they wanted to do. It is a space in which they can move freely. Capabilities: It is a parameter of measuring the ability of an entity (department, organization, person, and system) to achieve its objectives, especially in relation to its overall objectives. Autonomy: It can be defined as the independence of employees within the workplace for making the choices among the alternatives to achieve the organization’s goals. Entrepreneurial Mindset: It is defined as the mind-set of an individual which is indulging in the entrepreneurial activities and outcomes it also refers to state of mind which is often drawn towards opportunities, innovation, and new value creation. Dedication: It is the state of employee being emotionally involved in their work or an activity. It reflects strong feeling of support and loyalty for the organization. Experiential Learning: It is the process of learning through experience of others and is more specifically defined as “learning through reflection on doing.” It develops knowledge, skills and attitudes based on consciously thinking about an experience of the others. Wall of Fame: It usually refers to the display of individuals list of achievements to mark their recognition in their own field that are chosen by a group of experts. Competence: It is defined as the ability of an individual to do a job in an effective manner. It is a set of defined protocols that enables the identification, evaluation, and development of the behaviors of an individual employee that ultimately results in the employees’ performance.